The preferred mechanism for ObjectScript error handling is the TRY-CATCH mechanism. The $ZTRAP mechanism is provided for a more traditional style of error handling. InterSystems IRIS supports a TRY-CATCH mechanism for handling errors. With this mechanism, you can establish delimited blocks of code, each called a TRY block; if an error occurs during a TRY block, control passes to the TRY block’s associated CATCH block, which contains code for handling the exception. A TRY block can also include THROW commands; each of these commands explicitly issues an exception from within a TRY block and transfers execution to a CATCH block. The TRY command identifies a block of ObjectScript code statements enclosed in curly braces. TRY takes no arguments. This block of code is protected code for structured exception handling. If an exception occurs within a TRY block, InterSystems IRIS sets the exception properties (oref.Name, oref.Code, oref.Data, and oref.Location), $ZERROR, and $ECODE, then transfers execution to an exception handler, identified by the CATCH command. This is known as throwing an exception. The ErrorHandle variable is a handle to an exception object. This can be either an exception object that InterSystems IRIS has generated in response to a runtime error or an exception object explicitly issued by invoking the THROW command (described in the next section). where expression is an instance of a class that inherits from the %Exception.AbstractException class, which InterSystems IRIS provides for exception handling. For more information on %Exception.AbstractException, see the following section. InterSystems IRIS provides macros for use with exception handling. When invoked, these macros throw an exception object to the CATCH block. These system-supplied macros are further described in the “ObjectScript Macros and the Macro Preprocessor” chapter of this book. InterSystems IRIS provides the %Exception.SystemException and %Exception.AbstractException classes for use with exception handling. %Exception.SystemException inherits from the %Exception.AbstractException class and is used for system errors. For custom errors, create a class that inherits from %Exception.AbstractException. %Exception.AbstractException contains properties such as the name of the error and the location at which it occurred. TRY-CATCH error processing is compatible with $ZTRAP error traps used at different levels in the execution stack. The exception is that $ZTRAP may not be used within the protected statements of a TRY clause. User-defined errors with a THROW are limited to TRY-CATCH only. 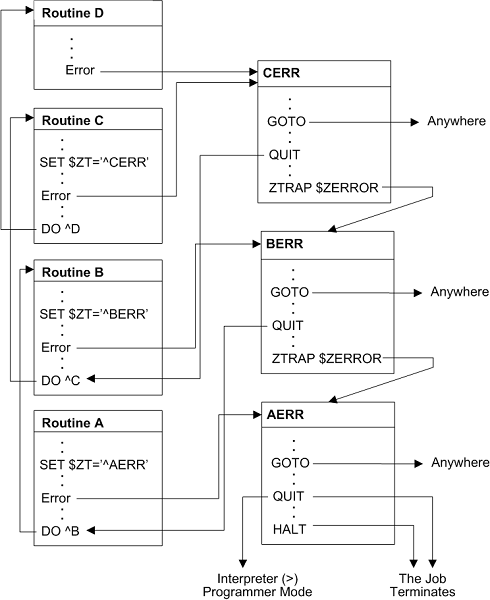 User-defined errors with the ZTRAP command may be used with any type of error processing. Many of the methods in the InterSystems IRIS class library return success or failure information via the %Status data type. For example, the %Save() method, used to save an instance of a %Persistent object, returns a %Status value indicating whether or not the object was saved. InterSystems IRIS provides several options for displaying (writing) the %Status encoded string in different formats. For further details, refer to “Display (Write) Commands” in the “Commands” chapter of this manual. For a list of error codes and messages (in English), refer to the “General Error Messages” chapter of the InterSystems IRIS Error Reference. For traditional error processing, InterSystems IRIS provides the functionality so that your application can have an error handler. An error handler processes any error that may occur while the application is running. A special variable specifies the ObjectScript commands to be executed when an error occurs. These commands may handle the error directly or may call a routine to handle it. If you signed onto InterSystems IRIS at the Terminal prompt and have not set an error trap, InterSystems IRIS displays an error message on the principal device and returns the Terminal prompt with the program stack intact. The programmer can later resume execution of the program. If you invoked InterSystems IRIS in Application Mode and have not set an error trap, InterSystems IRIS displays an error message on the principal device and executes a HALT command. To get the full benefit of InterSystems IRIS error processing and the scoping issues surrounding the $ZTRAP special variable, it is helpful to understand how InterSystems IRIS transfers control from one routine to another. 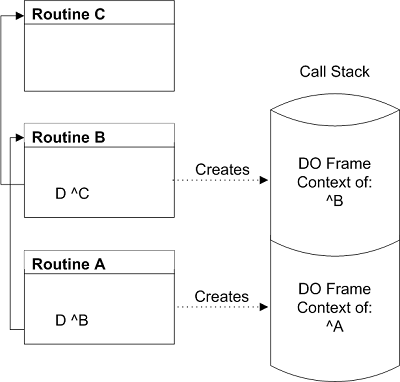 When routine A calls routine B with DO ^B, InterSystems IRIS builds a DO frame on the call stack to preserve the context of A. When routine B calls routine C, InterSystems IRIS adds a DO frame to the call stack to preserve the context of B, and so forth. If routine A in the figure above is invoked at the Terminal prompt using the DO command, then an extra DO frame, not described in the figure, exists at the base of the call stack. The $STACK special variable contains the number of frames currently saved on the call stack for your process. The $STACK value is essentially the context level number (zero based) of the currently executing context. Therefore, when an image is started, but before any commands are processed, the value of $STACK is 0. See the $STACK special variable in the ObjectScript Reference for details. See the $ESTACK special variable in the ObjectScript Reference for details. See the $STACK function in the ObjectScript Reference for details. When an error occurs and an error stack already exists, InterSystems IRIS records information about the new error at the context level where the error occurred, unless information about another error already exists at that context level on the error stack. In this case, the information is placed at the next level on the error stack (regardless of the information that may already be recorded there). When an error occurs, InterSystems IRIS sets the $ZERROR and $ECODE special variables to a value describing the error. The InterSystems IRIS error code, enclosed in angle brackets. The $ZERROR value is intended for use immediately following an error. Because a $ZERROR value may not be preserved across routine calls, users that wish to preserve a $ZERROR value for later use should copy it to a variable. It is strongly recommended that users set $ZERROR to the null string ("") immediately after use. See the $ZERROR special variable in the ObjectScript Reference for details. For further information on handling $ZERROR errors, refer to the %SYSTEM.Error class methods in the InterSystems Class Reference. See the $ECODE special variable in the ObjectScript Reference for details. When displaying the $ZTRAP value, InterSystems IRIS does not return the name of the private label. Instead, it returns the offset from the top of the procedure where that private label is located. When displaying the $ZTRAP value, InterSystems IRIS displays the label name and (when appropriate) the routine name. When an error trap occurs and the program stack entries are removed, InterSystems IRIS also removes all stacked NEW commands back to the subroutine level containing the SET $ZTRAP=. However, all NEW commands executed at that subroutine level remain, regardless of whether they were added to the stack before or after $ZTRAP was set. After a $ZTRAP error handler has handled an error, you can continue the application by issuing a GOTO. You do not have to clear the values of the $ZERROR or $ECODE special variables to continue normal application processing. However, you should clear $ZTRAP (by setting it to the empty string) to avoid a possible infinite error handling loop if another error occurs. See “Handling Errors in an Error Handler” for more information. When an error handler has handled an error, the $ZERROR special variable is set to a value. This value is not necessarily cleared when the error handler completes. Some routines reset $ZERROR to the null string. The $ZERROR value is overwritten when the next error occurs that invokes an error handler. For this reason, the $ZERROR value should only be accessed within the context of an error handler. If you wish to preserve this value, copy it to a variable and reference that variable, not $ZERROR itself. Accessing $ZERROR in any other context does not produce reliable results. If the error condition cannot be corrected by a $ZTRAP error handler, you can use a special form of the ZTRAP command to transfer control to another error handler. The command ZTRAP $ZERROR re-signals the error condition and causes InterSystems IRIS to unwind the call stack to the next call stack level with an error handler. After InterSystems IRIS has unwound the call stack to the level of the next error handler, processing continues in that error handler. The next error handler may have been set by a $ZTRAP. If the new error occurs in a $ZTRAP error handler, InterSystems IRIS passes control to the first error handler it encounters, unwinding the call stack only if necessary. Therefore, if the $ZTRAP error does not clear $ZTRAP at the current stack level and another error subsequently occurs in the error handler, the $ZTRAP handler is invoked again at the same context level, causing an infinite loop. To avoid this, Set $ZTRAP to another value at the beginning of the error handler. If another error occurs during the handling of the original error, information about the second error replaces the information about the original error in the $ZERROR special variable. However, InterSystems IRIS appends the new information to the $ECODE special variable. Depending on the context level of the second error, InterSystems IRIS may append the new information to the process error stack as well. See the $ECODE and $ZERROR special variables in the ObjectScript Reference for details. For further information on handling $ZERROR errors, refer to the %SYSTEM.Error class methods in the InterSystems Class Reference. You can add logic to your error handlers to check for errors caused by setting $ECODE. Your error handler can check $ZERROR for an <ECODETRAP> error (for example, “$ZE["ECODETRAP"”) or your error handler can check $ECODE for a particular string value that you choose. You can create your own error codes following the ANSI Standard by having the error handler set $ECODE to the appropriate error message prefixed with a “U”. InterSystems IRIS displays an error message on the process’s principal device. The process breaks at the call stack level where the error occurred. The process returns the Terminal prompt. In this case, $ZERROR indicates that the error occurred in mytest at an offset of 2 lines from the a label named WriteOut. Note that the prompt has changed, indicating that a new program stack level has been initiated. For a more detailed explanation, refer to Terminal Prompt Shows Program Stack Information in the “Command-line Routine Debugging” chapter. InterSystems IRIS provides several ways to log an exception to an application error log. Calling LOG^%ETN or BACK^%ETN automatically increases the available process memory, does the work, and then restores the original $ZSTORAGE value. However, if you call LOG^%ETN or BACK^%ETN following a <STORE> error, restoring the original $ZSTORAGE value might trigger another <STORE> error. For this reason, the system retains the increased available memory when these %ETN entrypoints are invoked for a <STORE> error.